With the payments domain, users can pay bills or initiate monetary transfers between themselves and other individuals using Siri. Your Intents app extension facilitates bill payment from the user to any vendors (such as public utilities) that were configured in your app in advance. For all payments, your Intents app extension works with your back-end services to initiate the transfers. The user then follows up on the progress of those transactions in your app. SiriKit automatically asks the user to unlock their device when processing any payment-related intents. You can provide a custom interface for payment-related intents using an Intents UI app extension. An interface for adopting all of the protocols in the payments domain. The handler interface for transferring money from the current user’s account to a different user’s account. A request to transfer money from the current user’s account to a different user’s account. Your app’s response to a send payment intent. 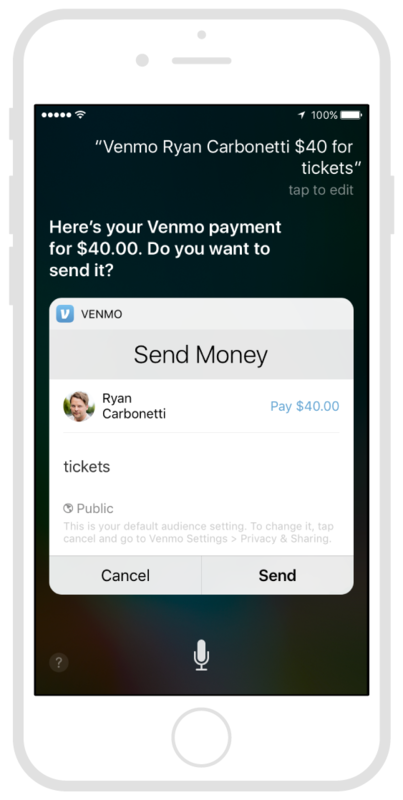 The handler interface for delivering a request for payment from another user of your app. An intent for requesting money from another user’s account. Your app’s response to a request payment intent. The handler interface for paying a bill using money from the user's account. A request to transfer of money to facilitate payment of a bill. Your app’s response to a request to pay a bill. The handler interface for searching for bills associated with the user. A request for the list of bills matching the specified criteria. Your app’s response to a request to a search for bills. The handler interface for searching for account information. A request for information about the user's accounts in your app. Your app’s response to a request to search for account information. The handler interface for transferring money between accounts. A request to transfer money between two accounts. Your app's response to a request to transfer money. Constants indicating the type of account involved in a financial transaction. The detailed information associated with a bill. The entity that receives the proceeds from a bill payment. An amount of money to transfer during a financial transaction. A user account that provides the funds when making a payment. The amount of money to apply to a bill payment. Information about a form of payment supported by your app. Detailed information about a financial transaction made between two users. Constants indicating the state of the financial transaction. The information about a user involved in a SiriKit interaction. A resolution result for account types. A resolution result for balance types. A resolution result for the types of bills that might be paid. A resolution result for the recipient of a bill payment. A resolution result for the user account that provides the funds to pay a bill. A resolution result for the amount to be paid for a bill. A resolution result for the payment status of a bill during a search. A resolution result for the currency amount associated with a payment request. A resolution result for the person being asked for payment. A resolution result for the currency amount being sent to another user. A resolution result for the recipient of a payment. A resolution result for the type of visual code being used to exchange information. A resolution result for a currency amount associated with an intent.